Lakeville Executive Suites: Virtual Office- Is it right for you? Virtual Office- Is it right for you? Are you starting your own business and need to save cash? Do you want to test the sometimes turbulent waters of the business world first before you sign a lease for office space or get a mortgage for a building? Does your business lend itself well to operating in a virtual environment? Are your employees willing to work from their homes, cars, or other moving targets? Or, do you simply think the environmental benefits are reason enough to consider a virtual work space? 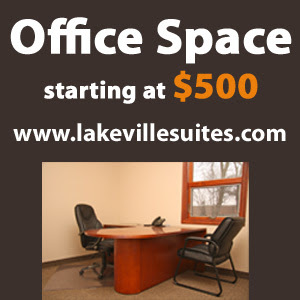 Lakeville Executive Suites offers Virtual Offices that include up to 40 hours of office time per month. But where will you do your work? Technically, your office is wherever you are. With the technology currently available, you can conduct business from almost anywhere. Your office could be in your home, in your car, in the airport, on the beach, or even on a mountaintop. In typical situations, your office will be based out of Lakeville Executive Suites for up to 40 hours per month regardless of whether you travel or not. Our clients find that 40 hours of part time office space is perfect since the rest of the month they are typically on the road with clients or traveling. First impressions mean a lot! Do you ever meet with clients? Lakeville Executive Suites allows its tennants full access to our conference rooms. Our conference rooms will leave your clients with a favorable professional impression of your business. If you're running a business from your home, you probably don't want your home address used as the business address. Depending on the type of business it is, it may just not give the impression you need. In this case, Lakeville Executive Suites can help. Lakeville Executive Suites offers a mailbox service that gives you a corporate address and a suite number. If your work involves traveling to client locations or other places away from your home base, you should probably consider buying a laptop computer rather than a desktop system. With a laptop you will always have your files with you and won't have any of those embarrassing moments where you left an important document at your office, because...well, your office is with you. While a laptop may seem a bit cumbersome to always travel with, there are many lightweight models out there that are very powerful. Just make sure you get a good carrying case that has a shoulder strap and room for your hard copy documents. If always working from the keyboard and small screen of a laptop doesn't appeal to you, there are other solutions. Yes, they've thought of everything! To make using your laptop more efficient in your home office or your Virtual Office Suite at Lakeville Executive Suites, a docking station can be set up that you can simply plug your laptop into. Docking stations make it easy to have a standard monitor, keyboard and mouse, printer, fax machine, scanner, and other peripherals always hooked and ready to use. By plugging your laptop into the docking station, you are able to use it just like a standard desktop system, and you won't have to worry about transferring or synching files to another computer. A black and white 600-1200 dpi laser printer if your final documents require crisp, high quality black and white output. Laser printers also provide the fastest output, so if you know your volume will be high you should also consider a laser printer. A color laser printer if your documents need high quality color illustrations, photos, or charts. These are quite expensive so make sure you compare the print quality with a less expensive ink jet printer. A fax machine if you will need to fax paper documents often. There is also the option of online faxing services such as E-Fax. A scanner if you will need to scan documents or photos. You can also use a scanner along with e-mail or fax software in place of a regular fax machine. Virtual office has helped me a lot in the development of my business as in such type of offices all the facilities related to the office are available. Yes.. We all should have a professional office space to work and look like professionals... firms like YES, have a virtual office in Miami, FL and an executive office suite within the reach. Get rented virtual office space starting from $50/month. Thanks. Read more on virtual offices offer prestigious virtual office addresses & provide dedicated receptionists to answer calls on your virtual phone number. Get Your Office Out of the Basement!